Now, we know All Y’all are always talking about how the Future Is Female. And here at Sistory, we love to talk about how the Past Is Female, Too. Case-in-point: Tammie Jo Shults, the Southwest pilot who emergency landed a plane after one of the engine’s failed, saving 148 lives in the process. Shults is rightly being lauded as a hero for the nerves of steel that got that plane safely to the ground. One woman died and seven were injured, but if Shults had lost her head, it could have been far, far worse. This was not Shults’ first foray into the world of high-stakes aviation. She was one of the first female fighter pilots in the Navy, an avenue she took after the Air Force turned her down. She was the first woman to fly an F-18 for the Navy and trained other pilots before joining Southwest. Nationally, less than five percent of all pilots are women. That’s due to several reasons, including that many pilots come up through the military, another male-dominated field, and that it can be a hard job for working moms. It’s just always been a man’s world, up in the skies, I guess. There was a time when it seemed women might be able to buckle their seatbelts, put their tray tables in the upright and locked position, and soar past that glass ceiling. In the early 1900s, the novelty of airplanes and the novelty of women leaving their homes unsupervised for the first time combined to create a Golden Age for women in aviation. Amelia Earhart, Harriet Quimby, Bessie Coleman, Louise Thaden – these pioneering women took to the skies. Helen Richey was one of those women. Richey was born in McKeesport, Pennsylvania, the daughter of the county superintendent. She was the only girl at her school who wore pants and once, ran off to join the circus. She returned home and decided to focus, instead, on flying. She became a well-regarded stunt flyer who won her first competitive flight after only 30 hours of training. Richey and her flight partner, Frances Marsalis (also a lady – can you say #squadgoals?) broke the record for longest flight – a terribly unpleasant sounding 237 hours and 43 minutes – thanks to in-air refueling. Twice during the flight, Richey had to climb outside the cockpit to repair parts of the wing. But Richey wasn’t here just to play games. She was here to work. 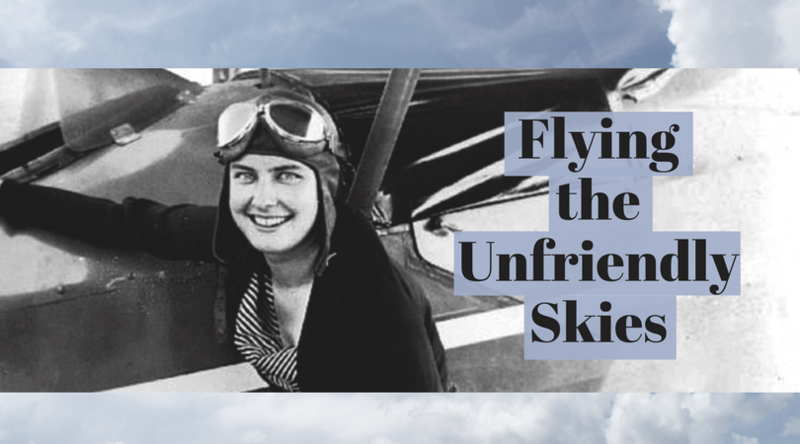 In 1934, Richey became the first woman to get her commercial pilot license in the United States, breaking out of stunt flying and into a “regular job” as an airline pilot. Richey quickly realized her new role was mostly a publicity stunt for Pennsylvania Central Airlines, and she wouldn’t actually spend much time in the air. It was a frustrating experience for Richey. The federal Bureau of Air Commerce grounded Richey’s flights, citing “bad weather” that somehow didn’t affect any other pilots. Male pilots threatened to go on strike because of her presence on the staff. She ended up flying just once or twice a month despite her qualifications. Richey quit after a year. But she wasn’t grounded for long. She resumed her stunt career, including co-captaining a race with Amelia Earhart. She flew for the federal government, looking for rooftops they could paint aerial markers on. And like so many women, she found career opportunities in World War II. Richey was the only woman to get an instructor’s license to teach Air Force cadets and eventually came to lead the British version of the WASPS. Her letters and biographers concur that these were the happiest days of her life. Finally, she had the chance to use her immense skill and talent. But when the war ended, the market was flooded with military pilots looking for work. Women were less in demand than ever. Richey couldn’t find work and became increasingly depressed. In 1947, Helen Richey, the first female commercial pilot in the United States, died by suicide in her New York apartment. She was 38. It’s all thanks to pioneers like Richey that we have women like pilot Tammie Jo Shults who did everything short of climbing onto the wing to stitch up the plane as it was going down. In fact, the history of women in aviation is filled with stories of those who met tragic ends while fighting for the respect, dignity and opportunity that was easily handed to their male counterparts. Helen Richey’s life was short, but her legacy is long. She paved the way for women to become commercial pilots. What kind of woman takes to the skies, preferring the thrill and danger of solo exploration over two feet on solid ground? A woman scared to death of finding herself at the mercy of anyone else’s priorities. A bird that would rather fly away from the flock, in the danger of the open air, than embrace the comfort of the cage. Or, say, a husband. Float like a Butterfly, Sting like a W.A.S.P. A bunch of ancient old ladies want one thing: to be buried in Arlington Cemetery. Why? Because they fought for our country, flying planes in World War II. Because they were awarded the Congressional Gold Medal. Because 38 of them died in combat. Because they are veterans and super old and basically a nicer version of Betty White, that’s why. So what’s the problem? Interesting blog. Though the gates to the cockpit for the females opened 80 years back with Helen Richey, still today there is just approximately 5% female pilots in the world.